The results of a new study of more than 1,900 sets of toddler twins may make you feel better about your own child’s picky eating habits: genetics were to blame for 46% of instances of food fussiness and 58% of refusals to try new food. By comparing the eating habits of identical and non-identical twins (i.e. 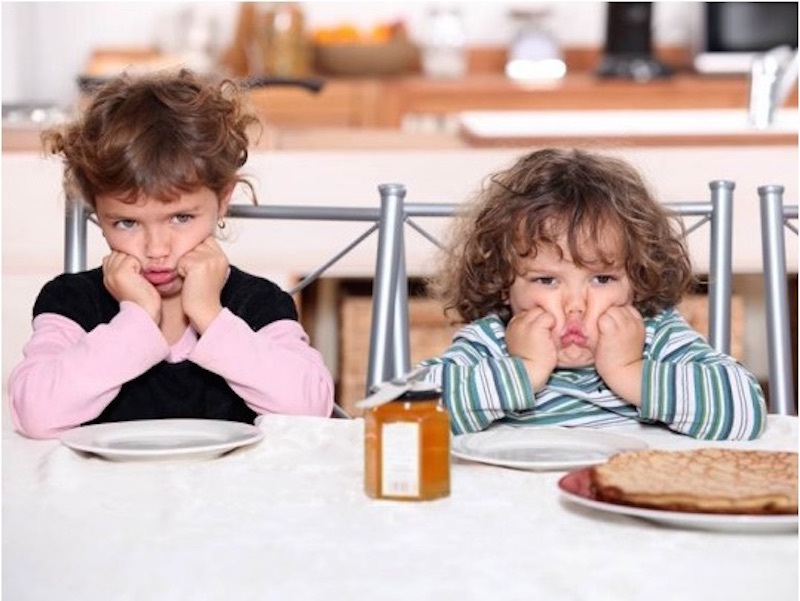 toddlers who share 100% of genes vs. 50% of them), the researchers found that genes play a significant role in whether or not your child will become a fussy eater. While you can breathe a sigh of relief that your precious little one’s predilection for only eating white foods wasn’t solely because you didn’t expose him/her to a wide enough variety of food, there’s still plenty of work for parents to do. Picky eating during toddler years is prevalent and is often associated with asserting independence, so in addition to keeping in mind that this period may simply be a phase, it’s important to continue offering a range of healthy options, staying away from lots of sweets during the weaning period, and making sure that whatever your child eats has sufficient nutrition. One tactic to stay away from: turning mealtime into a stressful power struggle by forcing or pressuring a child to eat certain foods. Keep calm and carry on cooking and serving a varied healthy diet for your family, bolstered by the fact that you can now check one common source of parental guilt off your list! The results of a new study of more than 1,900 sets of toddler twins may make you feel better about your own child's picky eating habits: genetics were to blame for 46% of instances of food fussiness and 58% of refusals to try new food. By comparing the eating habits of identical and non-identical twins (i.e. toddlers who share 100% of genes vs. 50% of them), the researchers found that genes play a significant role in whether or not your child will become a fussy eater. While you can breathe a sigh of relief that your precious little one's predilection for only eating white foods wasn't solely because you didn't expose him/her to a wide enough variety of food, there's still plenty of work for parents to do. Picky eating during toddler years is prevalent and is often associated with asserting independence, so in addition to keeping in mind that this period may simply be a phase, it's important to continue offering a range of healthy options, staying away from lots of sweets during the weaning period, and making sure that whatever your child eats has sufficient nutrition. One tactic to stay away from: turning mealtime into a stressful power struggle by forcing or pressuring a child to eat certain foods. Keep calm and carry on cooking and serving a varied healthy diet for your family, bolstered by the fact that you can now check one common source of parental guilt off your list!